Domesticated yaks are descendants of wild yaks (Bos mutus), which are indigenous to the Himalaya and Tibetan Plateau. For approximately 4,500 years they’ve been used for their fiber, meat, milk, hides, muscle power and dung (the latter is used for fuel, fertilizer and as a building material). 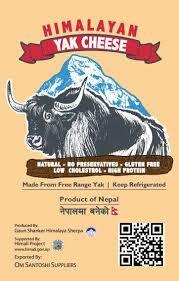 Yak milk is also wholesome, nutrient-dense and higher in butterfat than that of cows or goats. Jennifer Knoblauch raises yaks with her daughter, cheesemaker Amy Archer, who is one of the few people in Colorado producing cheese from yak milk (notably, a soft style with a consistency and flavor similar to that of a richer, full-fat whipped cream cheese). Yak fiber is used for yarn and clothing; according to writer and textile artist Wini Labreque, it’s soft, durable, water-resistant and “the downy undercoat … is similar in fineness to cashmere or qiviut (musk ox fiber).” Cynthia Hoffman-Phillips, owner of Mystic T Ranch in Central City, sells Tibetan yak fiber primarily to artists and home spinners. Basalt-based textile designers and importers Betina Moreira Infante and her husband, William Infante, established close relationships with entrepreneurial knitters, weavers and yak herders while living in Mongolia. Their new company, Hangai Mountain Textiles, sells stunning yak “down” throws, blankets, ponchos and other goods through local designer showrooms, such as Aspen Design Room and Cather’s Home. To learn more, visit HangaiMountainTextiles.com. If you’d like to learn more about the therapeutic effects animals have on people with autism, Temple Grandin’s books, Thinking in Pictures: My Life with Autism and Animals in Translation: Using the Mysteries of Autism to Decode Animal Behavior are excellent and available through her website, TempleGrandin.com. Ascendigo is a Carbondale-based nonprofit that “serves local, regional and national populations of youth and adults across the autism spectrum through experiential, community-based learning opportunities.” For more information or to donate, visit Ascendigo.org.